"Oh, how lovely to fly." It's every kid's fantasy to fly through the air, arms spread wide, drifting in the clouds. My favorite part in the book Peter Pan has always been when the kids first learn to fly, with the help of a little fairy dust. 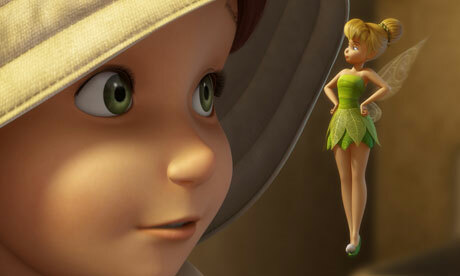 Perhaps, that's why I simply adore the newest Tinker Bell movie, Tinker Bell and the Great Fairy Rescue . A little girl gets the chance to fly. 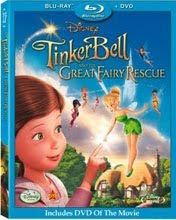 Tinker Bell and the Great Fairy Rescue , released on September 21st, is the third film in the adventure-filled Disney Fairies series. Summer has just begun and the fairies make a special trip to the mainland to attend fairy camp. Nearby, a 9-year-old girl named Lizzy and her father, Dr. Griffiths, have just arrived at their rural cottage. Despite warnings to stay away from humans, Tinker Bell flies off toward the cottage, entranced by the mechanical "horseless carriage" and her friend Vidia follows. In the meadow, they come across Lizzy's beautiful homemade fairy house, and Tinker Bell gets stuck inside. Lizzy discovers Tinker Bell in her fairy house and carries the fairy home to show her father. Luckily for Tinker Bell, Dr. Griffiths is very busy with his scientific entomology research and ignores his daughter's attempts at communication. Scared for Tinker Bell's safety, Vidia returns to camp and the fairies set off on a rescue mission by boat, in the middle of a heavy rainstorm, because they can't fly with wet wings. "Some people say that fairies are the stuff of fantasy. They think the world is just what you can touch and hear and see, while others say the tales and legends cannot be dismissed. They believe with all their hearts that fairies truly do exist." After a bumpy start, Lizzy and Tinker Bell strike up a special friendship. Lizzy loves stories about fairies and has spent most of her young life drawing and imagining their world. Lizzy tries to tell her father about her discovery but he refuses to listen, saying "Now, Lizzy, seeing is believing and without proof, it's just a fairy tale." The kindhearted Lizzy sets Tinker Bell free, but Tinker Bell cannot leave because of the rainy weather. Tinker Bell communicates with Lizzie using charade-like hand signals because Lizzy only hears the tinkle of a bell when Tinker Bell talks. She stays and teaches Lizzy all about fairies and, in typical Tinker risky fashion, she also tries to help fix the rocky relationship between father and daughter. Magical and beautifully told, this is a well-developed story of not one, but two rescue missions. I can't say enough good things about this movie and list it among my favorite Disney films. Creative and imaginative, it has all the ingredients of the perfect fantasy and the human and fairy interactions make the fairy world somehow seem more real than ever before. The bright and happy animation is gorgeously rendered, with blue skies and lush green landscapes. The film looks like it came right out of an extravagantly illustrated children's book. There are many cute little phrases like, "You scared the petals right off of me" and "The air - it smells grouchy." The adventure scenes are only very moderately scary and are appropriate for young children. My kids loved the humorous scene where the fairies can't fly and use pixie dust to elevate a series of cups and plates to escape from the dangerous paws of a fat cat. The wonderfully uplifting flying scenes make you wish you had your own bit of pixie dust. I asked my daughter about her favorite moment in the film, expecting her to comment on the flying scenes, but surprisingly she said she like the part where Lizzy's father tells her, "I believe you." This fairy film certainly soars above the other two in the series, and includes a lovely message of faith and friendship and, for parents, a message about the importance of listening to and spending time with your children. This special Blu-ray + DVD Combo Pack contains two discs, one for Blu-ray player and one for regular DVD players. The bonus features include deleted scenes with commentary, a "How to Believe" music video, a segment showing kids designing fairy houses, and an interactive Fairy Field Guide Builder game. The main feature runs approximately 77 minutes. 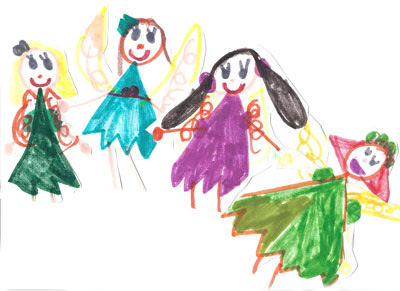 Like Lizzy, my daughter loves fairies and draws many pictures. Inspired by the movie, she drew her own set of paper fairies. They'd fit well in Lizzy's fairy field journal, don't you think?